This week we launch Jon Birch's wonderful Apollo Christmas movie. On Christmas Eve 1968 astronauts orbiting the moon made an amazing broadcast. With incredible visuals, euphoric electronic music and the words of the three astronauts - this movie takes a different spin on wonder at Christmas. waiting and silence is a new video on proost made by paul hutchinson and narrated by pádraig ó tuama.it is a 28 minute documentary, which explores a quaker meeting during an act of worship. it's perfect for lent exploring the role and function of silence and contemplation in our society. delighted to have this land at proost which continues to surprise against the odds with all sorts of creative content... there is a trailer here on youtube which gives the flavour. for the first time in a while the advent grace was nine, where we take the traditional nine readings from nine lessons and carols and invite nine people to choose a piece of music and do something else - a reflection, ritual or whatever. this year was great with a whole range of contributions. a favourite of mine was the first ever contribution from dave and helena who are new to grace. they made this wonderful film to go with the reading from isaiah 9 about 'the people walking in darkness'. we have quickly added this to proost so it's available to anyone now - it may be a bit late for this year but tuck it away for next if so! 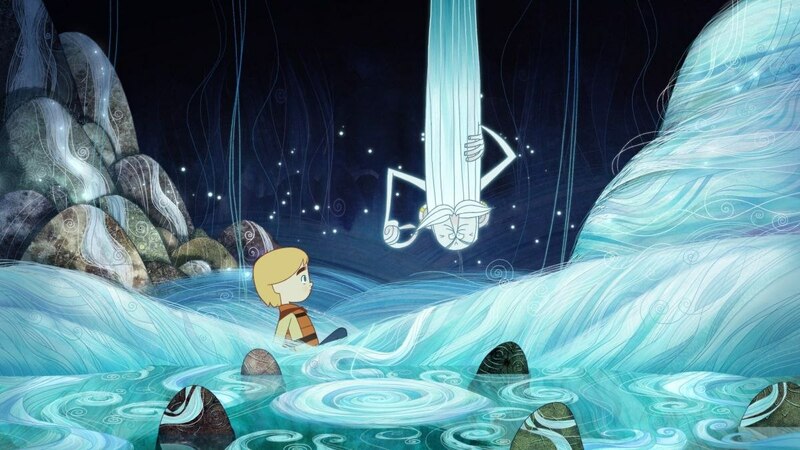 song of the sea is an amazing animation - go see it! sadly lots of people think you have to have kids to go and see a film like this but this really is not the case! it's an extraordinary film. it's a beautiful tale and stunning drawing - worth seeing for that. but it's also moving and powerful leaving you with a lot to think about. there's a mythical tale that runs parallel to a story of loss with some of the mythical characters played by the same voices as the characters they resonate with in real life. brene brown would have a field day in relation to the numbing of emotions to avoid pain - which leads to numbness across the board. in the case of the film it leads to losing the magic of and in life. i have been reflecting since that it is song in the film that frees trapped emotions - and art has that power in a way nothing else does… anyway i don't want to spoil the story. but it's a bit like where the wild things are with it's parallel of max's life and the monsters on the island. the forthcoming pixar film is also set to explore emotions which looks fun (though the trailer suggests it won't succeed in avoiding clichéd gender stereotypes). song of the sea has 99% on rotten tomatoes 100% on flixster, mark kermode gave it 5 stars - so i am not alone in my being wowed. last night i watched charlie brooker's screen wipe 2014. it's a month by month roll through the year with him taking pops at virtually everybody in his perceptive and sarcastic fashion. i laughed out loud several times. part of me wishes he would rant less and shift the tone as i think he has things to say to a much wider audience but i like it none the less... but in the middle of it was an extraordinary five minutes by the wonderful adam curtis who is the most brilliant documentary maker, at least when it comes to taking a helicopter view of the narratives in the wider culture. turns out that that segment is on youtube so take five minutes of your life and watch it. put down your ipads and put on your ipatches! i liked his book but never got round to reviewing it - especially the first half of the book and his exploration of the commons and beating the bounds. james balog gave a TED talk in 2009 and towards the end of this you see some of the time lapse movies. it's well worth 20 minutes of your life. i have been meaning to go to a gathering of ealing transition for a while so it was good to finally go and meet people and hear of local initiatives in response to climate change and shifting our dependency on oil. it's an extraordinary movement. one of the anglican 5 marks of mission is care for the environment. one brilliant way of doing that would be to join in with transiition if it's going on near you. it was a great day at ADVENTurous yesterday - if you liked the movies shown, several were from proost and three were made especially for ADVENTurous. prophet(tear) and wonky donkey were both on display in the exhibition and harry performed wonky donkey. if you are interested in advent resources on proost, have a look at our advent news which summarises lots, or click on the seasons button and search advent and/or christmas. oh and it's been pointed out to me after my blog post yesterday that advent actually starts today - advent sunday - of course! so all you people who have advent calendars with a dec 1 or advent candles with a 1 what were you thinking?! Sigur Rós - Rembihnútur from Sigur Rós Valtari Mystery Films on Vimeo. tim dendy is a london based freelance video maker, vj and photographer who is in moot. years back we did a series of worship images in a video tape as it was then between the ground breaking collective one small barking dog and grace. anyway he has created 7 movie loops using time lapse photography that are really gorgeous - VJ Loops 4. tim's loops seem to blend both the beauty and fast paced nature of life in the city. if you look on the VJ loops 4 page you can watch one of the loops there. in keeping with the ever shifting realm of technology we have made these loops hd size - i.e. great quality and size. then we have an album dark matter from a feckless boy. they hail from scotland and their music is soulful, aching and spiritual. there's something in the scottish soil that seems to cultivate this sort of soulful artistry in wonderful measure. have a listen to the preview track beza's song on the album page. i have got to know jonathan simpson through his dad phil who is a good friend and who works at cms. his dad travels around asia networking, catalysing and supporting mission. his son has clearly caught the love of asia and travel and he is quite the photographer. have a look through the images on his web site which is a lovely site all round. jonathan has put a movie together and entered it in india is... - a competition to capture something of india in a short film. his movie is india is for skiers. go and have a look and do take the trouble to vote for him! roll on christmas - brilliant playful facebook movie featuring you from the creators of shipoffools and featuring milton jones!